Battery Geek's new sleek, lightweight CPAP battery is the perfect accessory for CPAP user who has an active lifestyle! The BG-C150 CPAP/BiPAP battery pack from the Battery Geeks is a small, lightweight, high capacity premium grade lithium-ion cell with a built-in DC socket adapter, charger, and handy carrying case. Lithium ion batteries can be recharged at any discharge level without losing charge time due to battery memory loss. This little gem is the perfect accessory for CPAP and BiPAP users who are on the go and need to use their machine in a location that is not near an AC or DC power source. You can even use this battery pack to power other devices such as portable DVD and MP3 players which require a 12V power source in addition to your CPAP machine. These battery packs are FAA approved for use in airports and on airplanes, which means that they will also always clear all airport security checkpoints and will not be affected by the security x-rays. *** NOTE - We are currently out of stock for this item. We suggest that you consider the Owell Industries 266 watt-hr Compact Portable 12V Super CPAP Battery System. 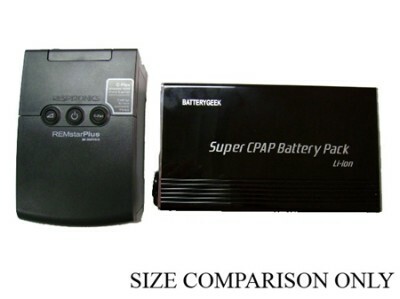 This CPAP battery is NOT recommended for Legacy Respironics REMStar BiPAP machines. In order to use this battery with machines that do not have provisions for a 12V power source, such as the Fisher & Paykel machines, you can use a Sine Wave power invertor along with your standard AC power cord to convert power to AC. Please note that conversion inefficiencies will substantially decrease usage times when used with an invertor. 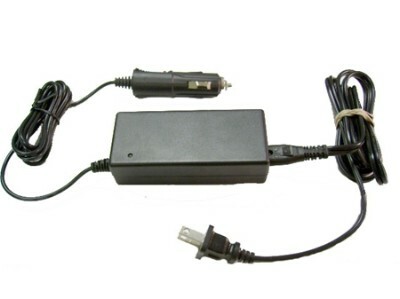 You MUST use the approved ResMed brand DC 12V power converter (PN 33942) in order to use this or any other DC battery with the ResMed S8 series CPAP machines. ResMed machines use reversed polarity, and the power converter provides needed power smoothing - you will fry the machine's power supply if you use any other cable! Addendum to user manual ™ After charging the battery, hold the battery test button for 10 seconds, or until the test lights display. This will activate the battery for use. CPAP Battery Runtime of up to 20 hours depending on CPAP machine and pressure settings. Aluminum alloy scratch resistant battery case. Built in circuitry protection against thermal run-away (overheating). Power gauge on battery indicates remaining usage time. Includes soft side carrying case. ** Please note - this is for the battery pack and charger only. 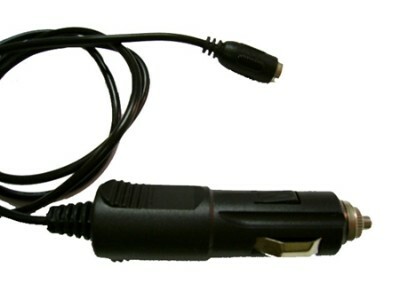 Unless you have a Respironics M-Series, you will have to purchase separately the DC adapter cable that is appropriate for your machine.